HOW DOES EXERCISING THE BODY HELP THE BRAIN? Exercise increases blood flow to the brain, improving brain health with the addition of oxygen and nutrients. The increased blood to the cerebral area of the brain gives it more blood (along with oxygen and nutrients) to work with. However, there is more to the improvement of brain health than just a better flow of oxygen. Exercise stimulates the pituitary gland’s release of growth factors and triggers release of serotonin, norepinephrine, endorphins, dopamine, all chemicals which improve mood, reduce stress and minimize the discomforts of exercise. Exercise increases levels of BDNF (brain-derived neurotrophic factor), a protein that repairs and protects brain cells from degenerating over time. A boost in BDNF has shown potential in reducing instances of ADHD in trials, and was found to be most notable with short bursts of intense activity. Exercise improves both mood and sleep. Athletes (anyone who exercises can be called an athlete!) report a feeling of satisfaction after a workout and of course, physical activity can make the body tired. Additionally, exercise has been proven to reduce stress and anxiety, both of which are known to lead to cognitive impairment. Stress is a known contributor to both health and mental impairment, and is a commonly-believed contributor to premature aging. When stressed, like when in fear, the body experiences the “fight or flight” response. Exercising releases endorphins, bringing the body back to a comfortable level. This is what allows athletes to feel relief, satisfaction, and happiness after working out. Participating in moderate exercise regularly for over 6 months is associated with an increase in volume of some brain regions. Gray matter (a vague term describing the useful parts of the brain, as compared to the space between) is increased in those who exercise regularly. By “revving up” your body, you are also “revving up” your brain, both in size and in function! Many scientific studies have been done which involved a variety of physical activities, and one review of physical exercise trials where cognitive function was measured, discovered that cognitive function in those over 50 improved with regular exercise of moderate intensity. Studies have been specific enough to provide evidence supporting any type of exercise you may want to focus on, or become more serious about, and there are some different benefits to be found with each one. Aerobic exercise boosts the size of hippocampus (verbal memory and learning) and improves cognitive function. Reduced hippocampus size has been found in older people suffering from dementia and Alzheimer’s disease. Walking has been studied most extensively, as most adults can begin a walking regimen, no matter their fitness level. Along with all the other benefits covered above, walking was proven to increase creativity in students in one collegiate study. Resistance training has been studied less than other exercise programs, but has also proven to offer brain benefits. As we get older, age-related lesions can be found on our brains, and affect thinking and memory abilities. Studies have shown that lifting weights have slowed down the growth of these lesions, and enhance executive function and memory. Yoga, although a less strenuous method of exercising, provided its own specific type of benefit. One small study in Boston found that after 12 weeks of regular yoga practice, participants increased levels of glutamate and GABA (gamma-aminobutyric acid), neurotransmitters which can lead to depression in low levels. The National Institute of Health found that the more years that an individual practices yoga, improvements to the left hemisphere of the brain were increased, which involves social behavior, impulse control, and self-awareness, to name a few. Bicycling, like other types of exercise, improved mental ability. Some studies have shown that when participants exercised four hours after learning something new, their memories were much more accurate. It is theorized that the brain chemicals released during exercise boosts mental ability, allowing the athletes to learn more efficiently. WHY NOT IMPROVE YOUR BODY AND MIND TOGETHER? You can see the benefits to your brain in the countless studies supporting the value of a variety of exercises, as well as to your body. Some of the gains are found in improved athletic abilities and respiratory strength, while others are best described as mental and psychological in measurement. There is no doubt that the profits are felt in all aspects of life, and with dedication, anyone can add exercise to a regular schedule. 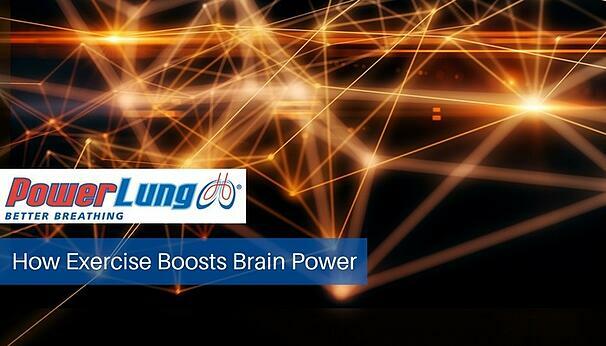 To help maximize the benefits of a regular exercise program, consider adding the PowerLung respiratory trainer. This easy to use device improves respiratory ability, helping you achieve more out of every workout. Exercise not only changes your appearance, but changes how you feel about yourself! The CDC recommends 2.5 hours of cardio exercise each week, plus an additional 2 days of muscle and strength training exercise. Make working out a priority and part of your regular schedule. Your body and brain will thank you!